Learn how to properly dispose your Christmas wreaths and other evergreen decorations in Wisconsin this year, so you can help stop the spread of a pest that was found on some holiday greenery. 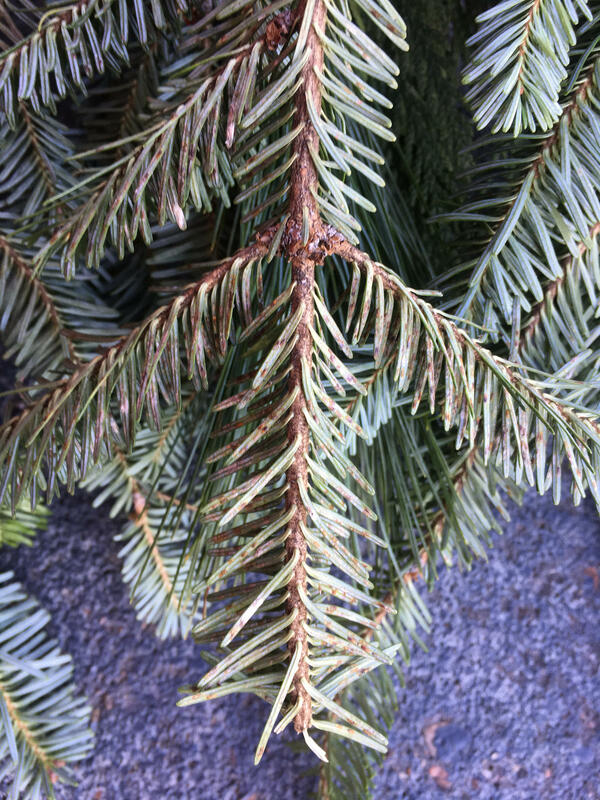 WUWM's Susan Bence reports on a pest that has been found on some evergreen decorations in Wisconsin and the best way for you to dispose of wreaths, boughs, and holiday greenery. An invasive insect made its way into some wreaths and other evergreen decorations across Wisconsin this holiday season. The tiny pest was found in decorative greenery — not Christmas trees — brought here from another state. The invader, called elongate hemlock scale or EHS, hasn't spread to Wisconsin’s forests. Wisconsin's Department of Agriculture, Trade and Consumer Protection hopes to keep it that way. So, the department is asking people to burn purchased wreaths and boughs, or bag and put them in the trash. Agency spokesperson Donna Gilson understands it might be foreign to some people to throw their wreaths and other evergreen decorations into a bag and then dump the sack in the trash, but says the environmental threat posed by the resilient, mite-sized invader warrants it. "They can get through Wisconsin winters, they get through Maine winters. Would you rather have them go and infest your evergreen trees, your neighbors’ evergreen trees, the evergreen trees in the park and eventually hemlock forest and other evergreen forest in the north woods," Gilson says. "I don’t think anybody thinks that would be environmentally sustainable either." It can be difficult to see the elongate hemlock scale on greenery, but look for little brown spots on the underside of the needles — the pest forms brown scales to protect itself. The pest is so small you can barely see it unless you’ve got a microscope. What is visible are little brown dots on the underside of the infected evergreen needle. The insect forms brown scales to cover and protect itself. Gilson says although EHS doesn’t kill evergreen trees, it weakens them. So, when the next pest or disease shows up, the tree will likely succumb. "The other reason we’re concerned is that it will attack up to about 40 different species of conifers or evergreen trees, including many of the species of fir and spruce — and that is the lifeblood of our Christmas tree industry," she says. Gilson says the insect is native to Asia but has made its way to the United States. "They have become pretty well established along the eastern seaboard for quite a number of years. The immediate source this time though was North Carolina," Gilson says. DATCP spokesperson Donna Gilson explained more about the threat of EHS to Wisconsin during this interview that aired on Lake Effect January 7, 2018. Although Wisconsin boasts many Christmas tree farms, Gilson says larger store chains often receive trees, along with boughs and wreaths, from other states. This season North Carolina suppliers stocked stores in Wisconsin including Menards, Home Depot, Pick ‘n Save, Steins and Kmart. Some were found to contain EHS. But Gilson cautions they may not have been the only stores with tainted greenery. "It can be other chains than those too … The only way to really be certain is if you bought your wreath or your door swag from a Wisconsin Christmas tree farm, then you know it’s not going to have EHS on it," Gilson says. While this might be confusing, the agency’s warning does not apply to Christmas trees, even if they came from out of state. So, Gilson says you can dispose of your tree as you normally do — for instance, compost it, put it out for the city to pick up or take it to a drop off center.